Posted by Joseph Mattingly in Travel Log. First of all, Happy Independence Day (or Good Riddance Day, as they call here) from the British Isles. I regret to inform you that all pyrotechnic devices are strictly discouraged in the 700-year-old tinderbox that is the Worcester College of the University of Oxford. More on that later. There are so many great things about Prague that I don’t even know where to begin. Also, in a futile attempt to salvage what is left of what might be my significantly thinned-out readership, I will warn you in advance of the multitude of really bad Czech puns. If this would cause you to stop reading my blog, this might not be a bad post not to read. 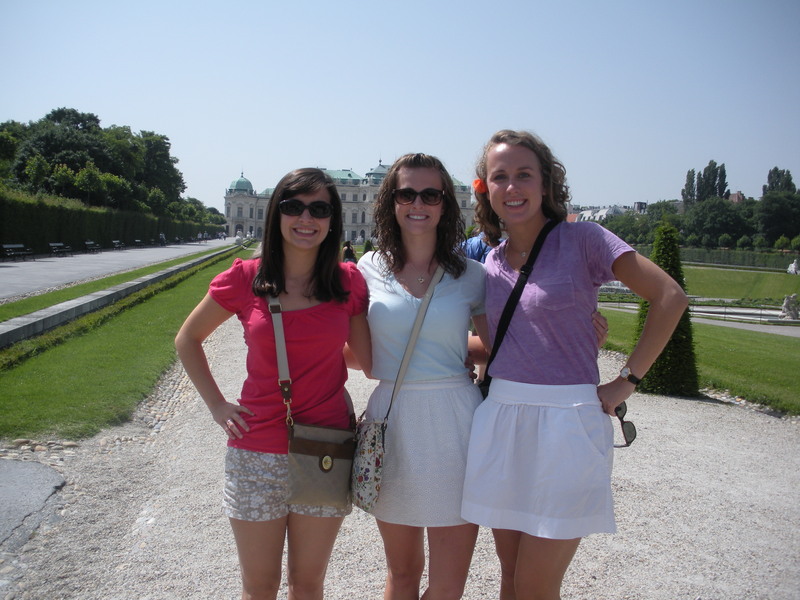 In preparing for our adventures in Europe, I was most eager about and had the highest expectations for Prague. I am 25% Czech and extremely proud of that heritage. I took a Czech name (Wenceslas, the one with a Christmas song) for my Confirmation. I watched Czech cartoons at my grandparents’ house. I loved my Czech ancestry. Obviously, there was a bit of pro-Czech bias on my part on the travel portion of the trip. As a special multimedia treat, I offer you a bit of fine Czech music for your listening pleasure while you read or don’t this entry. It is “The Moldau” from Smetana’s Má Vlast. “The Moldau” tells the story of the Vlatava River (also called the Moldau) which flows through Prague as a part of a seven-piece collection which, when translated into English, means “My Country.” If you are particularly inspired (or just need more than 13 minutes of background music to read this blog), use your favorite music listening service to check out the rest of Smetana’s Má Vlast. So, Czech out my adventure in Prague. We drove to Prague through some of the most beautiful Czech countryside in all of Europe. (Aha! you say. The only Czech countryside is in the Czech Republic. You would be correct, but realize that this just means that the Czech countryside is the most beautiful in Europe.) This was especially true after driving through kilometer after kilometer of Bavarian hops fields in (you guessed it) Bavaria, Germany. It was finally nice to see accent marks that we haven’t seen before on letters that we would never accent (consonants) to make sounds that are very clearly not there in the spelling. When we finally rolled into Prague, the beauty and wonder was no less. After crossing the Vlatava, which is a much more impressive river than any in the other European cities we have explored, we pulled in front of the hotel in a matter of minutes. The hotel was fantastic, and the welcome dinner delicious, but this is a post about Prague, not our hotel, so I digress. Because we had to take our art midterm on the first morning in Prague, we were given the rest of the day off. Armed with a map and a list of things to do in Prague courtesy of my aunt and grandmother, also known as the Czech aficionados, I set out into Prague with a few friends for an afternoon of exploring the capital of my homeland. 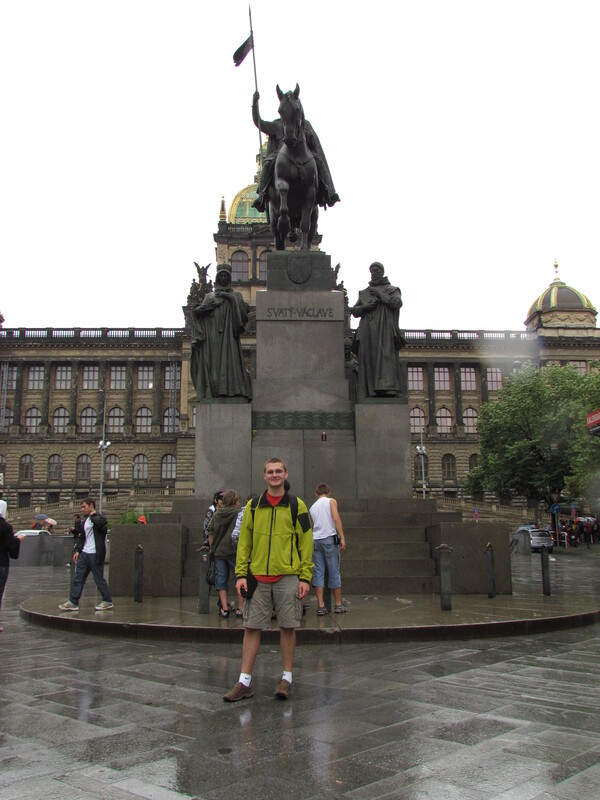 First on the destination list was Old Town Square, the heart of Prague. 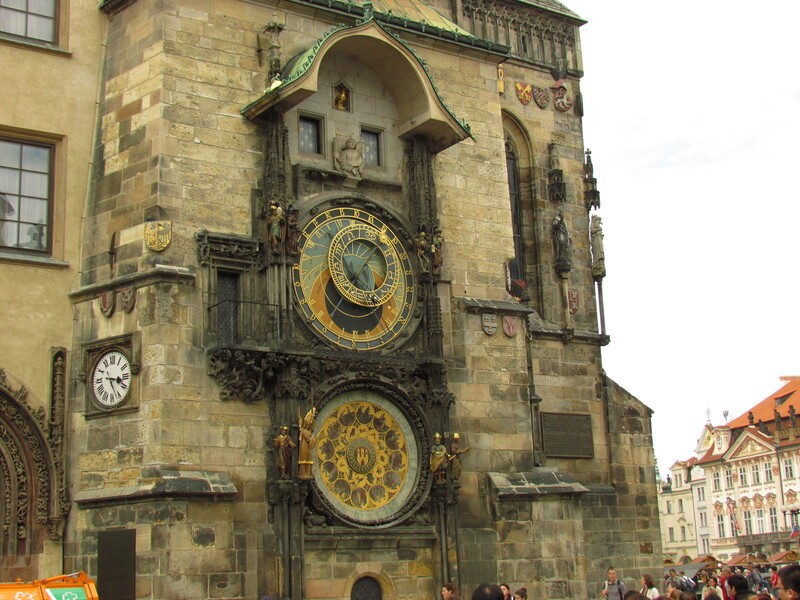 The main fixture in Old Town Square is the Astronomical Clock, which you see in the picture to the right. Being the curious Tech students we are, one of our main interests was ascending to the scenic top deck of the clock tower, which cost a mere 50 Kč (16 Kč = US$1), which was by far the least expensive ascension rate of any of the European ascendable monuments. The view from the top was incredible, as there was an excellent 360° panorama of the entire city. Next was the church of St. Nicholas, a very small, but very fancy chapel that made for a great quick photo shoot. We then made our way to the old Jewish ghetto, which is a significant part of the history of Prague. At that point, I found that I didn’t withdraw enough Czech money from the ATM, and thus only had 50 Kč, so we had to tour the Jewish monuments from the outside. (Admission was over 100 Kč!) 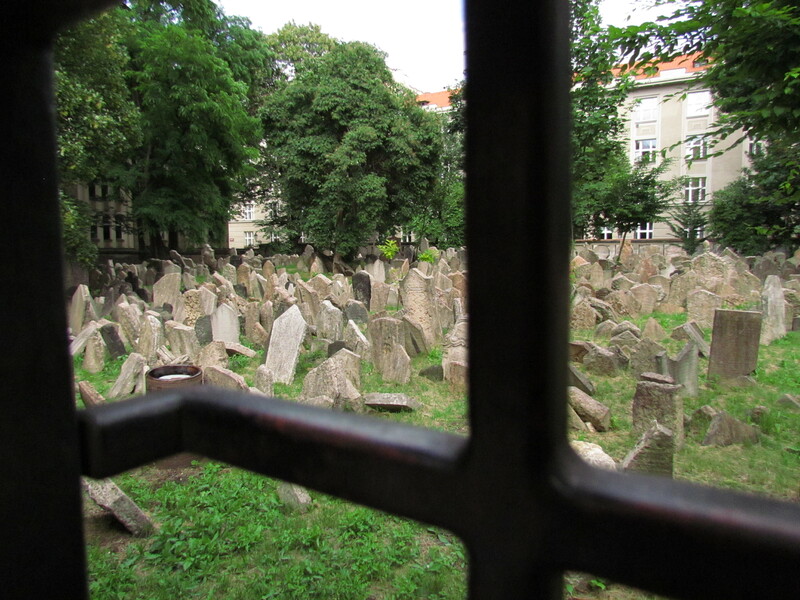 Perhaps most notable is the old Jewish cemetery. The density of graves can only be well-serviced by a picture, and this is just the small part we could see through a small fissure in the wall. Our second, and unfortunately last, day in Prague was more class-oriented. We made our way to the charming Charles Bridge (which actually was also done the day before on our explorations, but was left unmentioned because a certain blogger forgot to Czech his work…), an old bridge central to Prague history filled with statues of many Czech notables. From there, we ascended the hill/mountain to the Prague Castle, which is actually more of a cathedral than a castle. The Castle is notably home to such things as the remains of St. King Wenceslas (again, not seen on account of budgetary concerns) and the Defenestration of Prague, which sparked the Thirty Years War. (Ask me about the Thirty Years War in person. There are some non-PG things recounted by my high school history professor/demigod that will not be recounted here.) The Castle was absolutely beautiful inside and out, but even more impressive was the view from atop the hill, which overlooked the city. Equally important to my Prague experience was souvenir shopping. I should probably preclude this account with charming stories of my Czech-influenced childhood. There is a quite wonderful Czech cartoon that most Americans have not seen (and that’s their loss) called Krtek (Czech for “the Mole”), of which I have seen many episodes on account of my relatives bringing home Krtek VHS’s from the Czech Republic. 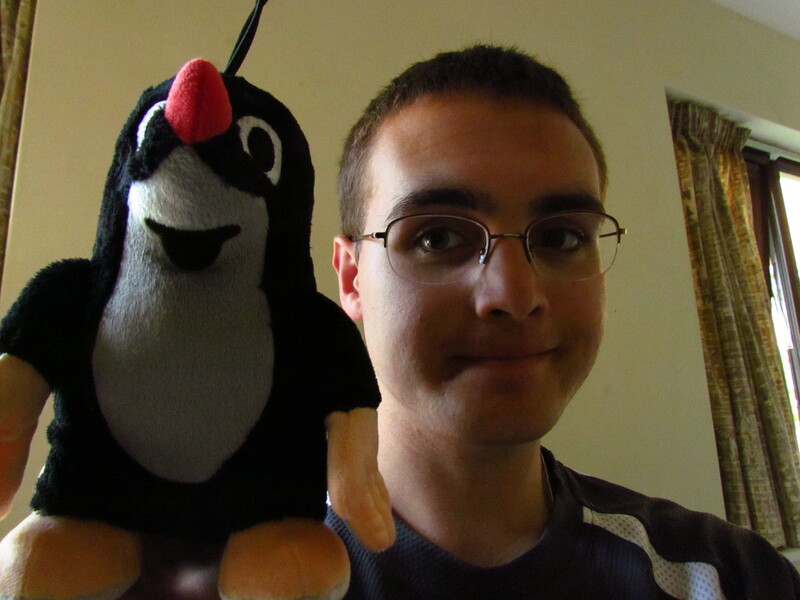 When I saw a plush Krtek in a souvenir shop, I knew I had to get it, as Krtek was an important part of my childhood. Because Krtek is a licensed product (think about trying to get a plush Bugs Bunny), I nearly had to sell a kidney to come up with the funds to meet the price tag. Fortunately, as you may recall from earlier, I am part Czech, and I had full intention of using this to my advantage. After sweet-talking the clerk with stories of growing up watching Krtek and my incredible pride in my Czech heritage, as well as throwing in some Czech words here and there, I was able to get a nice discount and nice souvenir from my homeland. The worst part of all was leaving. I had very few intentions of leaving because I loved the place so much. Even though I can Czech Prague off on my list of places I’ve been, you can bet I’ll be back again for a much longer rendezvous with my ancestral land. Until next time, dobrou noc! Posted by Megan Sweeney in Travel Log. Posted by Ethan Craig in Travel Log. It’s amazing how much life you can live in a short amount of time. Back home, on a typical Saturday, I’d rouse myself around eleven or so, eat something, bum around the house, eat again and perhaps spend some time with friends. Here in Europe, on a typical Saturday, I travel hundreds of miles by train over night, awake in a country I’ve never seen before and explore everything is has to offer. Praha (Prague) is a beautiful city! From castles to cathedrals, from clock towers to cemeteries, everything I saw this past weekend was amazing. The weather was gorgeous: sunny without a trace of cloud. What is most astonishing is that for some people living in a city like Praha is completely normal. They get up, get ready, and walk along the castle walls on their way to work. It certainly makes my route to class past Bobby Dodd stadium seem less impressive! Along the way, I also was fortunate enough to meet people from all over the world. It is pretty interesting to hear the story of a world traveler and what keeps them moving along. We met people from Australia, Belgium, Great Britain, Venezuela and even some from Atlanta, Georgia! For some, travel is a vacation, for others, travel is a lifestyle. Whatever the case, no matter how different our stories may be, something brought us altogether in the same place on the same weekend. I think that is pretty amazing.